Our aim is to be a reliable partner which provides all the support you need. We adopt a customer-focused approach, and satisfaction is our number one priority. Please see below if you have any questions regarding the ordering process, product and delivery information or complaint procedures. General queries are also covered. Is it possible to make a subsequent change to the invoice address? We will be happy to alter your invoice address. Please note that we can only change the address if the invoice has already been settled. PayPal is an easy and secure way of making payment. You will need to have your PayPal details to hand when you complete your order. We also accept credit card payments (MasterCard/Visa). We also accept debit card payments (MasterCard/Visa). Please get in touch with us if you have waited for more than 6 working days but have not yet received your parcel. We will be happy to contact UPS on your behalf. 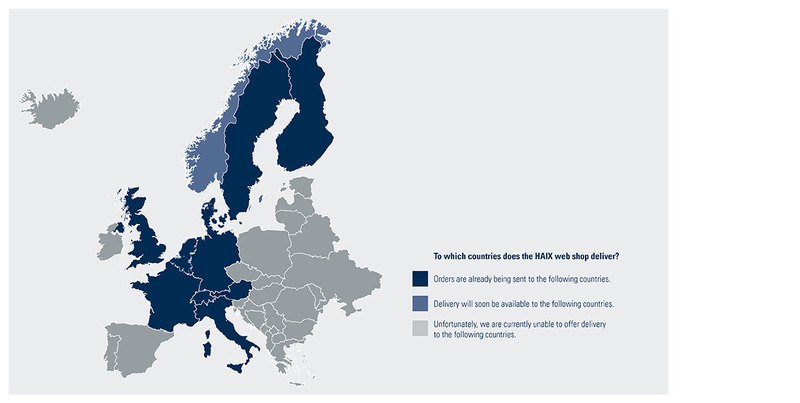 To which countries does the HAIX web shop deliver? Germany, Austria, Italy, France, United Kingdom, Belgium, Netherlands, Luxembourg, Sweden, Denmark, Finland. You may return ordered goods within 30 days of receipt. Returns are processed quick and straightforward. 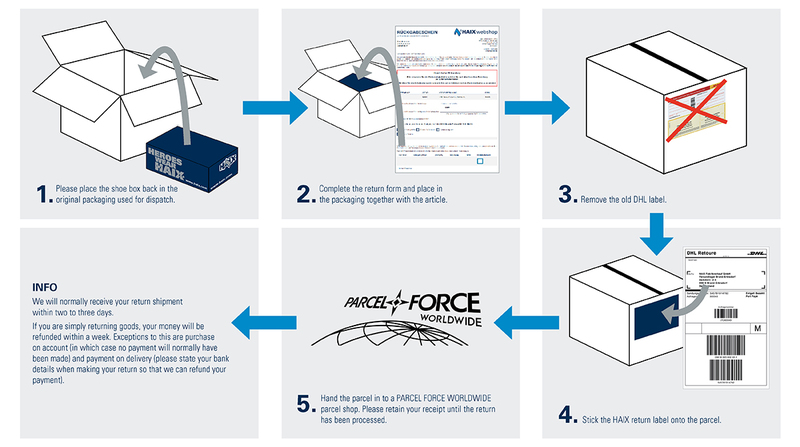 Each parcel includes a return label and a return form which provides details of the return process. Please complete this return form in full, place it in your return package and send both back to us. HAIX will pay the costs of the return shipment. 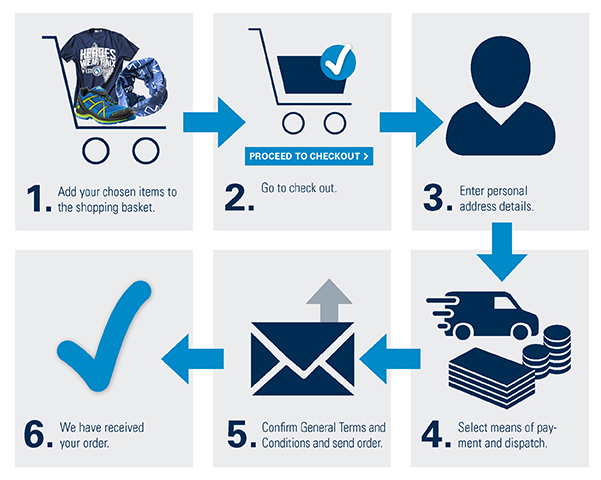 If goods are being returned, we will transfer the money back to your bank account within one week. Exchanges are generally not possible. Please place a new order to receive your required articles. The following items may not be returned: Shoes which have been worn or become soiled. Please be sure to retain your post office receipt when making a return. This contains your dispatch number. We will need this number to clarify the situation if we do not receive the parcel. What should I do if my shoes are too small? You should first check whether you have the right size. To do this, remove the inlay soles and place your feet on them. Make sure that the inlays are flush with your heels. Ideally, you should then have a space of between about 1.0 and 1.5 centimetres at the front for your toes. 1. One option is to send the shoes to us to be stretched. Shoes can be stretched by up to 0.5 centimetres. Shoes which have a toecap can only be stretched from behind the cap. Stretched shoes may not be exchanged. The stretching process is carried out free of charge. 2. The width of Vario Fit models can be regulated to a certain extent by using 3 different insoles..
Is a Vario Fit sole worthwhile for me? This can be checked by simply trying on the shoe without the insole. If you feel that you have enough room in the shoe, it makes sense to order the “wide” version of the Vario Fit insole. What should I do if my shoes are too big? How do I lace up my shoes correctly? Lacing systems may vary somewhat depending on the model. What is the difference between the Airpower X1 and the Airpower XR1? The Airpower XR1 has an improved outsole which features a special fin-shaped tread to ensure the very highest degree of slip resistance. It is cut slightly wider than the X1. The XR1 is also fitted with a significantly softer inlay to enhance comfort of wear even further. Unlike the Airpower X1, the toe cap and puncture-resistant sole of the Airpower XR1 are metal free. The XR1 also provides more reliable insulation against the cold and heat. In addition, it features reflective strips to the right and left of the zip fasteners. What are the differences between the Black Eagle models? How heavy are the shoes? Each model has a different weight. Weights are shown in the blue information section included on the individual product pages. Weights stated usually relate to size 42. Why do oversizes attract a supplement? Why is there an oversize supplement? The reason for this is that very large sizes are only infrequently requested by customers. This means that production costs are higher than for standard sizes. Production processes also need to be specially adjusted, for example, and material use is greater. Nevertheless, we wish to be able to continue to provide this particular service to our customers. We are, therefore, compelled to charge an oversize supplement for shoes which do not correspond to the usual sizes. Are you looking for a certain model which you cannot find in our web shop? It may possibly be a special or discontinued model. Are you looking for more detailed information about this particular shoe? Can I arrange to receive notification when an article is back in stock? We offer the facility to receive information about the availability of our articles. The only exception is for articles which have been discontinued, i.e. have sold out. No notifications are available for these models. Which shoes may be used with crampons attached? The HAIX Climber, the HAIX Nature Two GTX and the HAIX Protector Alpin are able to accommodate crampons. The statutory guarantee term of 24 months applies to our products for defects in material or manufacture. Parts which are subject to natural wear and tear, such as outsoles, are excluded from this guarantee. The guarantee also does not cover damage and defects caused to the product whilst it is fulfilling its protective function. We also accept no liability for defects caused by improper care and incorrect use. We will, however, repair such damage at cost price. Please fill out the repair form and put it in the package. In order to avoid misunderstandings, please enclose your original purchase receipt when making guarantee claims. Please note that defective footwear must always be returned as a pair. Please note that we will only accept shoes for repair that have been brushed clean. Soiled shoes will be returned without being repaired and at the expense of the sender. Packages for which postage has not been prepaid will not be accepted. Where can I send complaints/repairs? What should I enclose? - Copy of invoice (to check the guarantee) This is important in order to enable us to ascertain where and when the shoes were purchased. How do I care for my shoes correctly? Dirty shoes should be simply washed off using water and a brush. Do not attempt “fast drying” by placing shoes next to an open fire or stove or on the heating. This will change the shape of the shoe. Remove the inlay and stuff the shoes with newspaper, or use a shoe tree. Afterwards, allow the shoes to dry slowly in a well ventilated spot. We recommend that inlay should be regularly washed at a temperature of 30°. The inlay should be removed following each period of wear in order to accelerate the drying process. When caring for all types of leather, you should only use conventional non-greasy shoe creams and impregnation agents or products that have been recommended by HAIX. Do not use dubbing or oil. Textile upper materials are best treated by using a waterproof spray. However, such impregnation agents will tend to dry out leather if used alone. Leather can become cracked and hard if shoe cream is not used. Applying cream to the creased part of the tongue will also help to remove the squeaky sounds that may occur with hydrophobised leather. This will also provide metal parts (rings, hooks etc.) with additional protection against oxidisation. Sun Reflect reduces the heating effect on the upper leather caused by the sun’s rays. Sunlight is reflected, thus keeping leather and feet cooler. In order to achieve the best effect, we recommend using a colourless care agent or the care product specially developed by HAIX for use with the SUN REFLECT System. Using functional socks enables comfort of wear to be significantly enhanced. Such socks quickly transport any moisture generated by the foot whilst moving along to the lining material. When you are trying on your shoes, do so whilst wearing the socks you will use later. Information regarding the relevant standard for each model is contained on a printed label at the shaft of the shoe. Make sure that your shoes are a good fit and be careful with elements that are subject to wear and tear. If you are in any doubt, ask your specialist retailer. Take note of care instructions, and check your shoes for visible signs of damage prior to every period of wear. Store your shoes in a dry place, in the original box if possible. Of course, no date of expiry can be stated in respect of our products. This mainly depends on the degree of wear and tear and the use to which the footwear is put. Your shoes are labelled with the following information: manufacturer (HAIX®), applicable standard, category, size, month and year of production, type designation of the manufacturer. Should I apply an impregnating agent to my shoes at the outset? All of our footwear has been pre-treated prior to supply. You should make an individual decision depending on the prevailing weather conditions as to whether you treat your shoes once more prior to initial wear. How do I care for nubuck leather shoes? Treat shoes using the HAIX impregnation spray, which contains the relevant care substances. Apply the spray generously from a distance of 30 centimetres so as to enable the leather to absorb these substances. The shoes must then be left to dry naturally (not on the heating). If necessary, nubuck leather can be re-roughed using a brush (prior to and after use). When using safety footwear such as forestry boots on rough terrain, be sure to treat with a non-greasy shoe cream beforehand. The cream will provide the leather with more intensive care than an impregnating spray. Constant application of shoe cream will turn the surface of the leather from rough to smooth. This may lead to colour changes in some cases. Where can I obtain a HAIX catalogue? How can I sign up to or unsubscribe from the newsletter? Be the first to receive all the latest information by subscribing to the free HAIX newsletter. The HAIX newsletter is a non-binding service which may be cancelled at any time. A link to unsubscribe from the service is included at the bottom of every newsletter e-mail.